GreenDust provides high-quality, genuine and branded products at discounted prices. This is the best place for all those who are looking to shop for factory seconds and refurbished products. The products include mobiles and tablets, laptop and desktops, electronics, home appliances, kitchen appliances, health care and other such stuff. The products that are available at this online store are backed by one-year warranty and after sales service. These products may be defective in appearance but does not affect the functionality. You can use these Happy Sale promo codes that are listed on this page to save more on the GreenDust products. Shop now at Greendust to get Upto 50% Off on LED TVs. you can find products from leading brands like AOC, Haier, LG, Micromax, Samsung, Sharp. This Offer valid on landing page products Only. No need to use any coupon code to get this offer. Greendust Offers upto 55% off on branded laptops like HP, Lenovo, Dell, Hcl, Acer etc. No coupon code is required to avail this offer. Discount may vary from product to product. This offer valid on landing page products only. Greendust Presenting Upto 50% Off on Refrigerators, you can find the Godrej, Haier, Kaff, Whirlpool and more leading brands. Hurryup, Buy the Refrigerators with low cost for this summer season. you don't need any greendust promo code to get the discount. Greendust Presenting 80% discount on blackberry mobiles. you can find blackberry z10, 9900,9360,Q5 and more. Hurryup This is valid for a limited period. Buynow.! Greendust presenting Best discount on Home appliances. you can get upto 52%. All products from leading brands like DMR, Gem, Godrej, Haier, Kelvinator, LG, Onida, Panasonic, Samsung, Savon, Whirlpool only. This offer valid on landing page products only. You don't need additional promo codes to avail it. Shop and get upto 30% Off at GreenDust. No GreenDust coupon codes required to make avail of this offer. Follow to the landing page where you can get the refurbished laptop's at a best condition. Here you can select from the brands like Acer, Dell, HCL, HP, Lenovo and lot more. Shop and make avail of this best deal now! GreenDust is the India's premier online shopping site that provides customers a bulk refurbished products that are un-used at a lowest prices guaranteed. Here there is a special discount upto 80% on mobiles that are presented on the GreenDust. You can select from the massive collection of various branded mobiles online like Apple, Blackberry, HTC, Intex, LG, Micromax, Motorola, Nokia, Samsung and lot more. No GreenDust promo codes required to make avail of this discount. No coupon code is required to avail this offer. Get all the refurbished home appliances online with best deals at GreenDust. Here at GreenDust you can get all the home appliances upto 60% discount. You can select from the guaranteed products like microwaves & OTG, direct cool refrigerators, frost free refrigerators, washing machine, AC's, voltage stabilisers and lot more. Follow to the landing page and select your appliances to make your orders. GreenDust offers flat 88% off on H and K accessories online. Look on to the landing page where you can get this combo set at a best price of just Rs 210. No discount codes required to get this offer. Avail now! Purchase Dell laptop back pack with multi utility cables and wireless mouse combo online at GreenDust and avail at a best price of Rs 650. Not needed any coupons to get this deal. Hurry up and place your orders now! Avail Best Deals on refrigerators that to save upto 40% off. Look on to the landing page where you can choose and make your purchase. Not needed coupon codes to gain this discount offer. Shop and get today! Get Flat Rs 50 OFF On Orders Of Rs 499 & Above. Applicable on all orders across the site. Here you can get discounts on mobiles, tablets, laptops, electronics, home & kitchen appliances, health care essentials & more. Apply GreenDust coupon code at check out page to get the discount. Verified on 20/4/2019 .. Get Flat Rs 75 OFF On Orders Of Rs 999 & Above. Buy anything from the entire website. Choose from mobiles, tablets, laptops, electronics, home & kitchen appliances, health care & more to get this discount offer. Apply coupon code at check out page to discount. Get Flat Rs 150 OFF On Orders Of Rs 499 & Above. Choose from various products like mobiles, tablets, laptops, electronics, home & kitchen appliances, health care & more. Apply promo code at check out page to get this exclusive discount offer. Avail today! Get Flat Rs 250 OFF On Orders Of Rs 4499 & Above at GreenDust. Here you can avail discounts on mobiles, tablets, laptops, electronics, home & kitchen appliances, health care & more. Apply discount coupon code at check out page and save now! Shop and get Flat Rs 350 OFF On all orders sitewide at GreenDust. Minimum cart value required to get this offer is Rs 9999 & Above. Here you can get the discounted products like mobiles, tablets, laptops, electronics, home & kitchen appliances, health care & more. Apply coupon code at check out page to avail the discount. Get flat Rs 750 OFF on all orders across the site. Minimum purchase should be Rs 17500 & above. Buy anything from the entire website like mobiles, tablets, laptops, electronics, home & kitchen appliances, health care & more. Apply coupon code at check out page to get the offer. Get Flat Rs 500 OFF On Orders Of Rs 14999 & Above. Buy anything from the entire website. Apply coupon code at check out page and make avail of this deal. Avail now! Get Flat Rs 1000 OFF On Orders Of Rs 20000 & Above. Buy anything from the entire website. Choose from categories like mobiles, tablets, laptops, electronics, home & kitchen appliances, health care & more. Apply coupon code at check out page to discount. Get Flat Rs 1500 OFF On Orders Of Rs 25000 & Above online at GreenDust. Choose from massive collection of products on the site belongs to various categories and get this offer. Apply promo code at checkout page and avail today! Shop for various electronics with the best deals at GreenDust. Here you can get flat Rs 50 Off on your minimum purchase of Rs 499 onward. At GreeDust you can select from the vast collection according to the categories like mobile & tablets, laptop's & desktop's, electronics, home appliances, small appliances, kitchen appliances, health care and lot more. This mentioned GreenDust coupon is valid on all the categories and all the products that are available on the site. Shop now and save on your purchases. Get all the refurbished best electronics online at GreenDust with the best deals. Here there is an GreenDust coupons code to get flat Rs 75 Off on your minimum purchase of Rs 999. This GreenDust coupon is valid on all products across the site. No other coupon codes can be clubbed with this deal. Follow to the landing page and select from the vast categories that are available on the site. Shop now! Shop for all the refurbished electronics with the best deals at GreenDust. Here you can get all the electronics from different categories at a best condition. Apply the mentioned promo code on your purchase of Rs 25000 and get flat Rs 1500 Off. This GreenDust coupon code is valid on all the products that are available on the site. No other coupons can be clubbed with this deal. Shop with HappySale online deals and save more. Shop for various mobiles, tablets, electronics, home appliances, kitchen appliances, health care, small appliances and lot more with a best deals at GreenDust. Shop above Rs 1500 and apply the mentioned GreenDust promo code to get Rs 250 Off on your purchase. Follow to the landing page to select from the products and place your orders now! Get Flat 10% OFF On Clearance Sale Products. Choose from mobiles, ear phones, bags, watches, clothing and more. Apply coupon code at check out page to get discount. Looking for the perfect place to spot surplus stock or refurbished products on the web? Greendust is here to help you grab the lowest prices guaranteed on all these products. Find best offers on mobile accessories, mobiles, home appliances, electronics and much more at the best prices on this portal. You can browse their products, compare prices, read specifications and do a much more here. Use “go quickly to” option to shop some of the most popular category products in no time, such as tablets, mobiles, DVD players, LCD TV, laptops, headphones, fans, irons, LED TV, etc. With jaw-dropping discounts on all their products across various categories, this store also offers EMI options to let users buy conveniently. 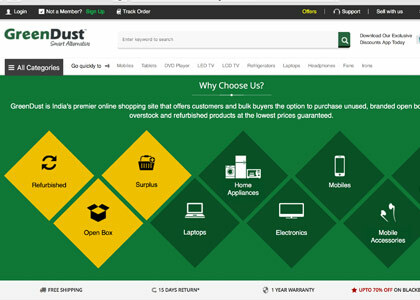 Greendust brings factory seconds, overstock products at unbeatable prices. They have about 250+ stores on-board and aims to present the best ever online shopping experience with their pricing. Their products list keeps changing, but one thing that you will see in common is their affordable pricing. Here are some of the popular categories seen on their website - electronic gadgets, mobiles, mobile accessories, computers, batteries, laptops, ACs, washing machines, desktops, blenders, mixers, heaters, personal care products and a lot more. Explore your favorite products from well-known brands such as LG, Whirlpool, Samsung, HTC, Apple, Micromax, Nokia, Toshiba, Panasonic, Blackberry, Karbonn, Philips, Videocon, etc.